Just about every July, my brother-in-law takes his family up north to go camping. 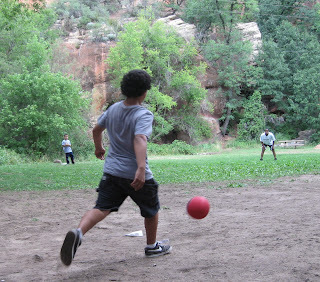 They always go to the same place, the Cave Springs campground in Oak Creek Canyon. Over the last six years or so (with the notable exception of last year), we have tagged along, at least for a few days each time. Camping at Cave Springs brings a welcome break from cicada season here in Phoenix, and relief from all the symptoms of summer madness their ceaseless droning represents. Another few minutes of driving and the surroundings have completely transformed into something strangely wonderful. 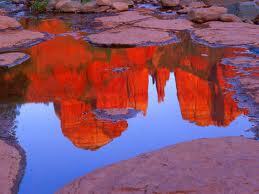 It is a realm constructed entirely from enormous red blocks of weather-sculpted sandstone. The world outside the car has abandoned its standard, bland palette in favor of one that focuses with an artist’s intensity on just three colors: that signature color of the land itself, which we call red, but which is really an indescribable mix of pinks and reds and oranges and creams, and whose predominant hue seems to change with every elusive morphing of the light; the deep, dark, absorbing green of juniper and pine which cover the hills, stud the slopes of the buttes’ bases, and sprinkle across their tops like chocolate jimmies on a cupcake; and the color of a sky so sweet, so juicy, and so thickly blue that for some reason you can only think of watermelon, and how much you’d like to sink your teeth into it, and let those cool sky-juices run right down the sides of your mouth and drip from the point of your chin, puddling sky-blue at your feet. Their combined vitality produces an exquisitely interlocking balance, a harmonization to some secret platonic template of beauty. It’s no wonder the vortex-worshippers and crystal gazers go ga-ga for it. I know I feel different when I get there, although I’m not there to align my chakras or get my aura read. But there is a mental shift that takes place upon arriving in red rock country, and for me it's the moment of release from all the work and stress that comes from getting the hell out of town. 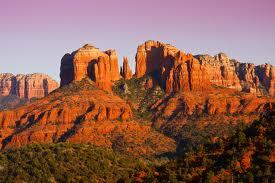 Sedona is my visual confirmation that the escape is real, and now. In turn, my body instinctively begins to relax, and my high-revving mind downshifts to a slower gear, automatically lowering the frantic spinning of my brain to a smoother, calmer rpm. 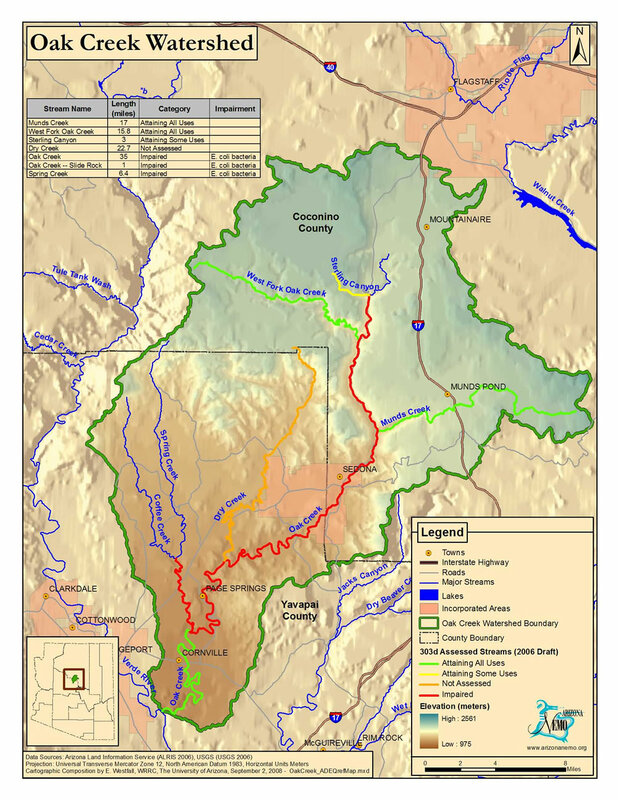 On the far side of red rock country lies Oak Creek Canyon. 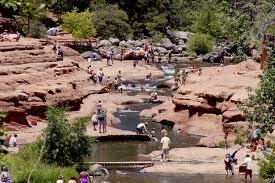 Oak Creek is most famous for Slide Rock, where the water has carved out a series of chutes and slides over the slippery, burnt orange sandstone. It used to be a cut-off shorts and t-shirt kind of place, a chaotic free-for-all, with cars choking the narrow roadway, and heatbeaters descending in droves to the creek, clad in flip-flops and lugging coolers through the tangled hillside by means of a dozen or more semi-worn paths. Now it’s a highly organized state park with tightly controlled access and a twenty dollar parking fee. There’s a pedestrian bridge, and a big asphalt-covered parking lot, and stairs down to the creek. The roadsides are roped off to keep people from stopping there, but the road still chokes up as cars wait for a spot to open in the lot. I think it’s the stairs that bother me most, though. Whatever it is, I seem to have lost my desire to go there anymore, or even take my daughters there, who have never been, though I suppose one of these years we will take them, if only out of a sense of duty and obligation. Aside from Slide Rock, the canyon remains a largely intact joy. 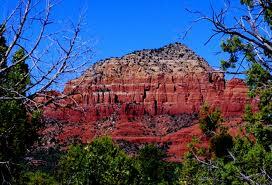 Once you leave Sedona, which still happens with startling suddenness, it’s shaded and much more tranquil, a sharp contrast to the gaudy, dizzying cacophony of that town’s short, but hyperbolically touristy, drag. There are a good number of small resorts, motels, inns, cottages, cabin rentals, homes and businesses tucked into the sides of the canyon where it’s wide enough, but the tall canyon trees and naturally thick vegetation have grown up around these places, obscuring many of them from plain sight, and minimizing the sense of obtrusiveness of most others. Buildings tend to be laced thinly and fit to the scale of the canyon, allowing Mother Nature to retain at least a semblance of her dignity. Considering the shameless, though spectacular, exhibition of just a few miles back, I’m sure she appreciates the opportunity to recoup some degree of modesty. The road winds north, mostly along and above the creek. In many places, it is entirely canopied by great oak, pine and sycamore trees. The steep canyon walls may have lost the red intensity of Sedona, but they exude a warm, caramel-creamy buff tone, with rosier tints still blushing through in places. 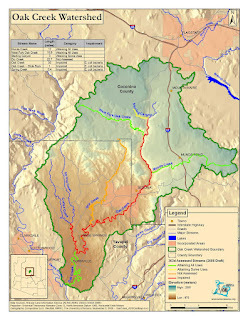 In town, the temperature can surpass a hundred degrees on a summer day, but inside the canyon it drops with the gain in elevation and the density of the forest surrounding it. Five miles past the town, it feels about ten degrees cooler. It’s still hot enough to push most summer afternoons to the brink of comfort, and even a little beyond it, but that only makes a swim in the Oak Creek’s cold waters a refreshing and immensely effective way to blunt the afternoon edge. There are a couple of things that, as far as I know, set Cave Springs apart from the other campgrounds in Oak Creek. One is a small, open, grassy area not quite large enough to be properly called a field, although in these cramped quarters it passes for one. This is where we play our annual game of kickball, with teens and grown-ups kicking with their off-foot to prevent the ball from sailing into the thick, prickly underbrush, or bouncing off the road and into the creek itself. Everyone plays, and we usually end up attracting at least a few extra kids who find themselves unable to resist the allure of the game. On the far side of the field, at the bottom of the canyon wall, is a small, fenced off opening in the rock. This is the cave which gives the camp its name. Inside the cave sits some machinery, including a pump that is used to collect and distribute the spring water that used to emerge here to the spigoted outlets throughout the camp. It’s a dark, hollow and slightly spooky place. It has an abandoned feel to it, and stories abound of snake sightings and critters and such. Most kids, naturally curious initially, seem a little reluctant about approaching it again later. 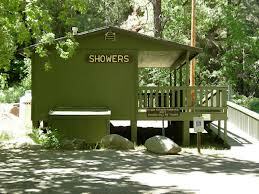 Cave Springs also has showers, a relative rarity for public campgrounds. It costs four bucks to take a shower, but after a couple of days enduring a wide range of temperatures as well as exertion levels, they deliver that special kind of mercy only a shower seems capable of bringing. It probably also cuts down on the number of people who try to turn the creek into a bathtub, which is a very good thing. 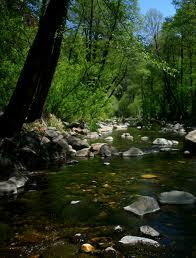 The part of Oak Creek which runs adjacent to the campground is blessed with a variety of swimming holes. The water runs shallow near the entrance to the campground, making it easily accessible from the road. It forms a nice wading/play area, and it also has a small pool deep enough for young kids to swim some. But because the creek is stocked with trout, it also attracts people who want to try their luck with a fishing rod. This sets up an undercurrent of antagonism between the swimmers and the fishers, because there’s just not enough room to do both in the same spot. In this case, I am firmly on the side of the swimmers, since it’s the only place in the camp that’s easily accessible for families with toddlers and young children who can’t hike through the underbrush or the rocky banks to reach the other parts of the creek. Not to mention the older folks, or those who can’t get around well, who just want a place to dip their toes, or do a little wading. Honestly, a fisher who isn’t willing to walk further than a paved road, or put even a little bit of effort into procuring a more isolated fishing spot, deserves to have their trout stamp revoked (assuming they bought one in the first place). The baser members amongst this breed of fisher express their opinion on the subject by gutting their catch right in the creek, and allowing the heads and entrails to float around and pollute the area where the kids might otherwise be swimming. 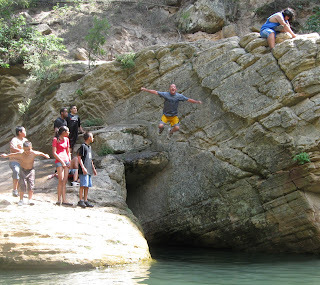 Swimming-fishing conflicts aside, those people who are willing and able to follow the creek a little bit further downstream are rewarded by a number of swimming holes that are bigger, deeper, and less populated than the one near the entrance to the campground. Our favorite of these is about a ten minute hike from camp, and involves crossing the creek by stepping on a considerable series of unsteady stones. Following the creek’s far bank leads to a good-sized pool, maybe eight to ten feet deep at its deepest, which has a Goldilocks-like set of rocks from which swimmers can leap into the frigid water. There is a baby rock (maybe five feet high), a mama rock (ten or so) and a papa rock (twenty or more). We can spend hours at this particular hole, and while it’s unusual to have the place entirely to yourself, there never seems to be more than ten or fifteen people around at any given moment. The best time to go is mid-afternoon, when the heat of the day is greatest and being in the numbingly cold water doesn’t give you an uncontrollable case of the shivers. If you plan it just right, by the time you get back to camp and thoroughly dry out, the sun will just be about to drop behind the western canyon wall, and from there you’ve literally got it made in the shade. The biggest drawback at Cave Springs, in terms of certain modern expectations at least, is, of course, the bathrooms. The bathrooms here are the old, vault-type toilets. They constantly stink, and no matter how often they are cleaned, there are always bugs in the corners in a mixed state of existence. Toilets like this probably serve as the single biggest deterrent to camping in the first place. You wouldn’t think such a thing exists that can make a porta-potty look like the height of luxury, but that’s exactly what the good, old-fashioned vault toilet does. Yet as counter-intuitive as it may sound, I hope they never replace them. Vault toilets are one of the few things keeping the spiffy, slaves-to-creature-comfort masses from overrunning the place and turning the whole campground into some kind of Best Western. Anyway, I hope that gives you a general overview of the area we like to go to escape the droning days of our desert summer. We have just returned from spending four days and four nights there, with all the joys and travails that come from camping in a tent and sleeping on air mattresses. Next time, I’ll share more specific impressions and observations from our most recent trip to Cave Springs.